In his stocking feet Meat moved away from the barn, crouching low and keeping to the shadows he quickly made his way into the forest that surrounded the small farm. His skin crawled as he vanished into the gloom, the remnants of the nightmare that had awakened him still fresh in his mind. He had been dreaming about that lone house surrounded by an overgrown yard through which unseen things slithered within shadowy spaces. He and the man he called Dad had taken refuge within those silent walls that weren’t so quiet, the whispered memories of its past lying at the indistinct edge of consciousness as the ghosts of a happier time moved through shadowy rooms. A swing set in the back yard offered mute testimony to the joy that had once inhabited the house. Its rusted chains squeaking with a plaintive cry as an errant breeze moved it to and fro. Pictures on the mantle piece, covered by a deep layer of dust, provided evidence that this dead place had once known life, light, and the happiness of a growing family. In one photo a man and woman stood together, the woman leaning back in the man’s strong arms, their entwined hands resting on her swollen belly. The photo had both frightened him, and filled him with a sense of loss, sorrow for a child that might never know the joys life had to offer. Joys he himself had never known. A part of him understood, with a maturity beyond his years, that his sorrow was for himself and the other children he’d seen struggling to survive in a world turned upside down. Pushing away the dream, and the memories it awakened, he slowed his steps considerably to keep from stirring the dead leaves at his feet, and alerting the target. Carefully he worked his way around until the tractor was directly between he and the barn. He knew then he was getting close and he stopped to listen. In the deep shadows ahead he heard movement. Turning his head to the side he watched from the corner of his eye, as he had been taught by the man he called Dad, and was rewarded with a glimpse of a shadowy form crouched at the tree line. The stranger was watching the barn and house that glowed with the ghostly light of the full moon. Seemingly unaware of Meat’s presence. Ever so carefully he worked his way around behind the watcher, maintaining his distance, the soft breeze stirring the leaves around them helped to mask any sound he made, while at the same time carrying away his scent. He was slowly approaching the figure when, warned of his approach by some primitive sixth sense, that shadowy form suddenly spun around to confront him. From the gloom came the sound of cold steel being drawn across leather and Meat spotted the faint glimmer of a blade. He stepped back, dodging the arc of the sharp edge that narrowly missed laying open his throat. 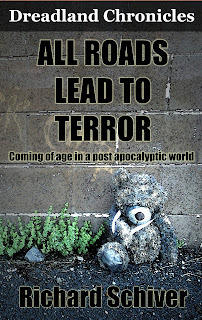 Weaving to the right, away from the blade, Meat lunged forward, his right hand grasping what felt like a small neck, his fingers digging into pliable flesh. From the shadowy form came a strangled cry of surprise. Meat felt a small hand wrapping itself about his wrist as the faint glimmer of the blade flashed in the shadows. He felt the blade as it passed across his forearm, the faint sting of cold steel slicing through warm flesh. Meat drew back his left hand, balled into a fist, and slammed it into the unseen face above his right hand. The figure suddenly went limp as Meat held on, knowing that if he let go he might lose the watcher in the gloomy depths that filled the forest around him. Holding onto the neck of the stranger he stepped out of the tree line into the overgrown field, and the pale light of the moon. It looked to be a boy, no more than ten, his torso bare, the flesh of his back and chest covered with black markings that made little sense. Meat looked up as Window crossed the field towards him. Window grabbed the young boy by his other arm and together they returned to the barn with their captive between them. 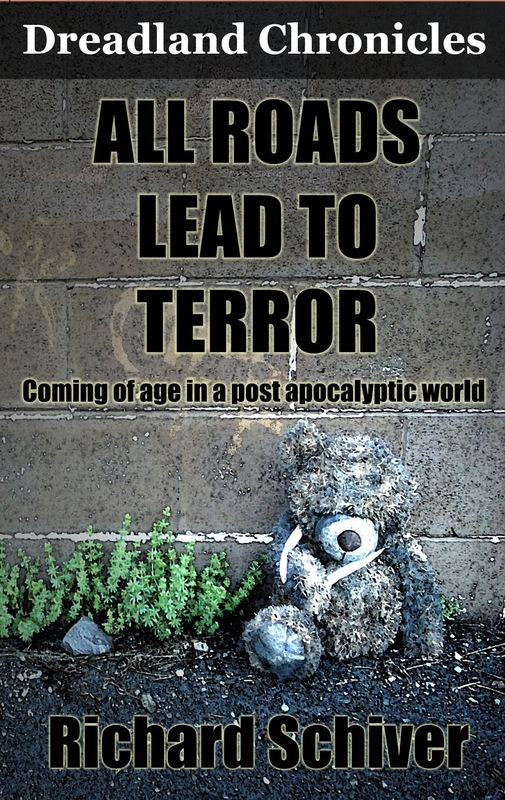 Sign up to help me spread the word about All Roads Lead to Terror and be entered into a drawing for a chance to win one of two print copies I'll be giving away when the book is released in print.